Lake Titicaca from the Bolivian border. Lake Titicaca, South America's largest freshwater lake, with a length of 177 km (110 miles), on the boundary between Peru and Bolivia. Cradled in the Andes at an altitude of 3,810 m (12,500 feet), being the highest of the world's major lakes. Lake Titicaca also the world's highest lake navigable to large vessels. In 1862 the first steamer to ply the lake was prefabricated in England and carried in pieces on muleback up to the lake. Today vessels make regular crossings from Puno, on the Peruvian shore, to the small Bolivian port of Guaqui. A narrow-gauge railway connects Guaqui with La Paz, capital of Bolivia. The world's second-highest railway runs from Puno down to Arequipa and the Pacific, linking land-bound Bolivia, with the sea. The lake riches the maximum depth of 270 m (900 feet), but the level fluctuates seasonally and over a cycle of years. During the rainy season (summer, from December to March) the level of the lake rises, normally to recede during the dry winter months. It was formerly believed that Titicaca was slowly drying up, but modern studies have seemed to refute this, indicating a more or less regular cycle of rise and fall. The lake's moderate temperature, makes suitable for year round navigation and fishing. Old shorelines and terraces, which can be cultivated, indicate that it was once much larger. The lake has two basins, north and south, linked by a narrow straight. 25 mountain streams, with melted snow and ice feed into it. It covers some 3,200 square miles (8,300 square km). 95 per cent of the lake's water is lost through evaporation. 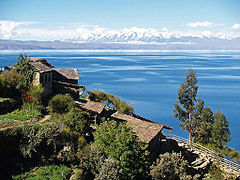 Many of the 41 islands in the lake, of which Isla de Titicaca (Also called Isla del Sol), is the largest; are populated. Ruins on the shore and on the islands indicates the previous existence of one of the oldest civilisations known in the Americas. One of the oldest site is at Tiahuanaco, Bolivia, at the southern end of the lake. On Titicaca Island ruins of a temple mark the spot where, according to the tradition of the Incas (a Quechuan people of Peru who established an empire about 1100), the legendary founders of the Inca dynasty, Manco Capac and Mama Ocllo, were sent down to Earth by the Sun. In Inka mythology, Manco Capac and Mama 0cllo, children of the Sun, emerged from the depths of Lake Titicaca to found their empire. Practically encircled by snow-capped peaks along its shores, the vast blue lake is one of the Andes' most fascinating scenes. The Uru people still live on artificial "islands" made from bundles of matted reeds, and use boats made of the same reeds, much like the ancient Egyptian Papyrus reed boats. This community continues to live within the traditions of the 14th century, according to the principles of Inca life. Here, without noting the passing of time, the three golden rules of the Empire of the Sun have been kept, Ama suwa, Ama quella, Ama llulla (do not steal, don't be idle, and do not lie). The contact with other civilisations has not been able to destroy the profound identity of the Inca way. The Aymara people living in the Titicaca Basin still practice their ancient methods of agriculture on stepped terraces since before Inca times. They grow barley and the potato, which originated on the Altiplano. The highest cultivated plot in the world was found near Titicaca growing barley at a height of 4,700 m, (15,420 feet) above sea level. At this height the grain never ripens, but the stalks are good forage for llamas and alpacas, that serve the Indians as beasts of burden and a source of meat. We've very much enjoyed our train over twelve hours of train ride through the ever changing Andes landscape.